Serena & Lily, oh I could gaze at their catalog for hours! Talk about Global Eye Candy and such Unique Finds! 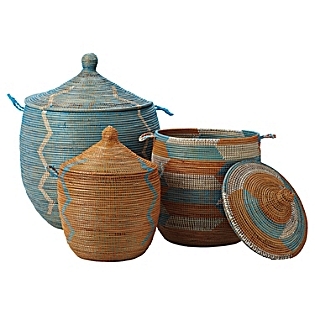 The Senegalese Covered Basket Collection comes in several Colorways. Perfect for added storage! This Damascus Inlaid Mirror has been on my Wish List and I have several places in my home where this would glow Beautifully! They show you items individually, in groupings and in room settings, which I love! This image features the Pumpkin Border Rug, however look at all of the other amazing finds available in this One Room!! One of the first Specialty Companies to show how a Nursery does not have to look "Babyish". Take out the Crib, add a daybed or twin and a boys room continues on for years! 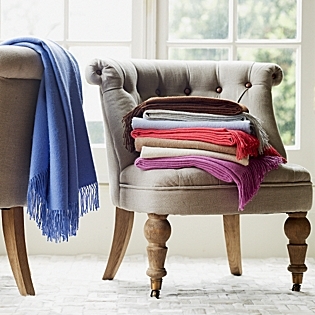 Cozy Comfort in Serena & Lily's Alpaca Throws come in a Multitude of Colors! Two Looks for the Master or Guest Bedroom; A Classic Navy and White. Another with Au Currant Aqua and and Coral; a new Color Palette Combination! 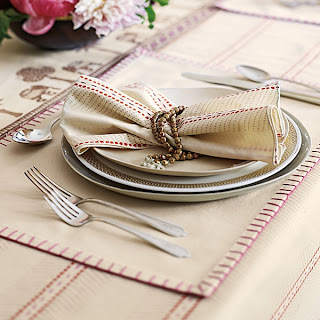 Mombasa Table Linens Perfect all Year Round! 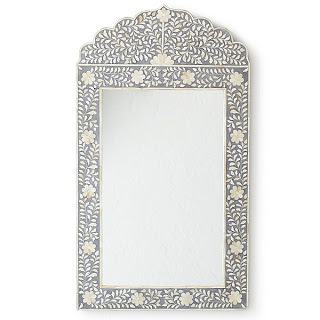 Serena & Lily is offering their Artfully Beautiful Trio of Jali Frames! I am sure most of you took Holiday Photos of Family and Friends, your Decor and Trees! "It’s the little details that make these frames so special. 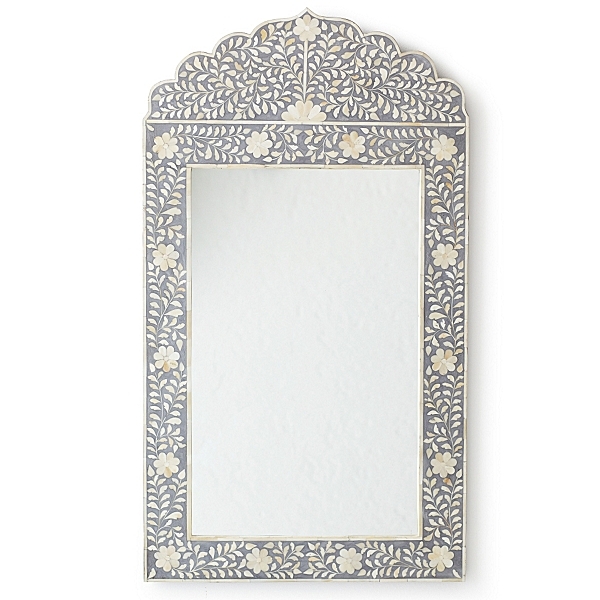 Handcrafted by Indian artisans, the intricately carved lattice work brings lovely texture to smooth white bone. Work them into your photo displays––the subtle design elements mingle well with other frames. Add them to your go-to gift list." 1) To enter; please Visit Serena & Lily. Peruse their super site and come back to comment on what you would love to have in your home! The winner will be chosen on Saturday January 7th at Midnight EST!! This Giveaway is open Internationally!! 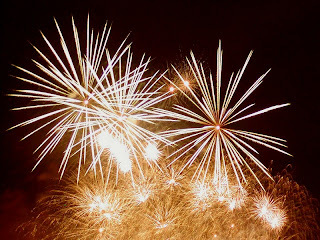 Wishing you and your all the Best in 2012! 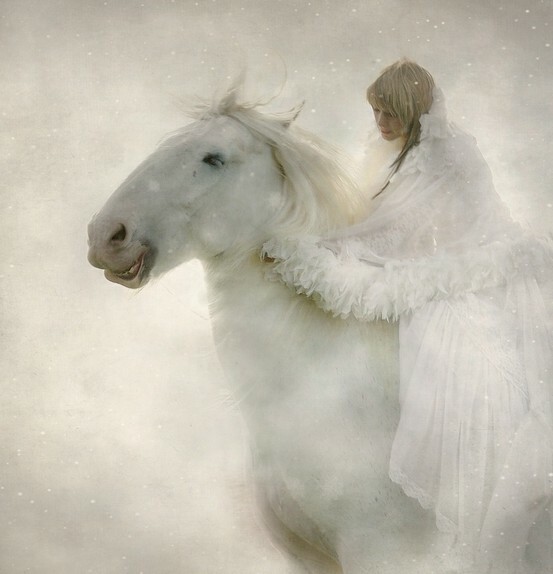 Ride Like the Wind! Feel the Breeze! Thanks to all of you for the Joy, Encouragement and Friendship You have brought to me! 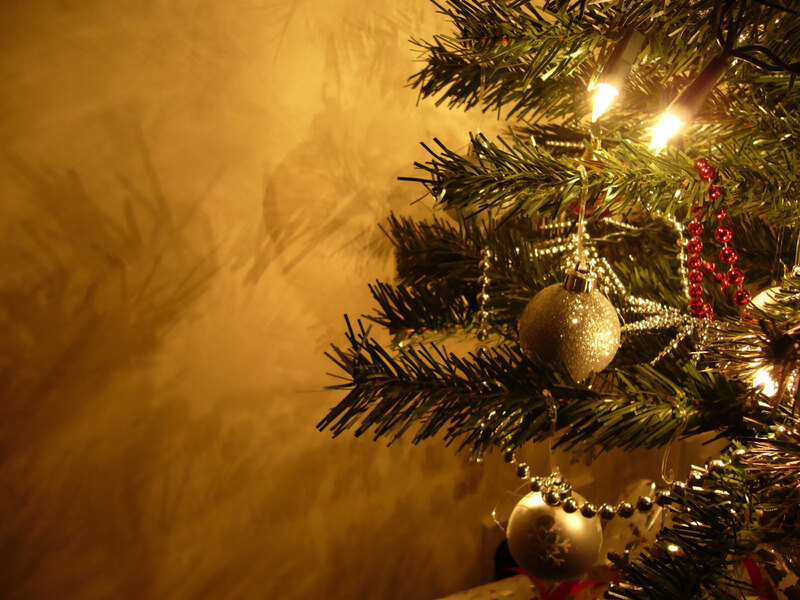 Love and Hugs to All!! Artist Mary Maxam is offering an original work of her fine art for the 12th Day Of Holiday Giveaways! This little treasure will be perfect in any spot of your home. I love her description of this 9 x 9 painting below titled "Breakthrough"
This is a sky that is part from a reference and part from memory. You know how it is...you're traveling, you see the storm in the distance, and now and again there seems to be a breakthrough of light and rain that just couldn't be held back. 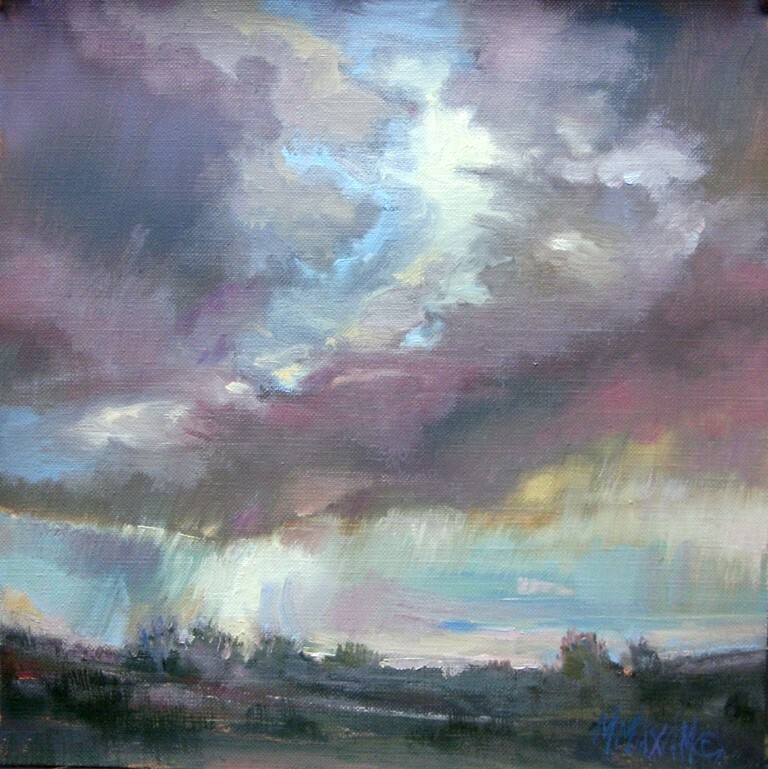 Then it always makes me think about that one place, what's happening right underneath that spill of light and rain?This is a sky that is part from a reference and part from memory. You know how it is...you're traveling, you see the storm in the distance, and now and again there seems to be a breakthrough of light and rain that just couldn't be held back. Then it always makes me think about that one place, what's happening right underneath that spill of light and rain? 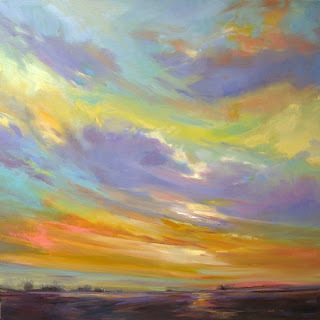 Mary's Blog, Mary Maxam Paintings is wonderful. She does painting demonstrations, shows videos of works in progress and displays her daily paintings! 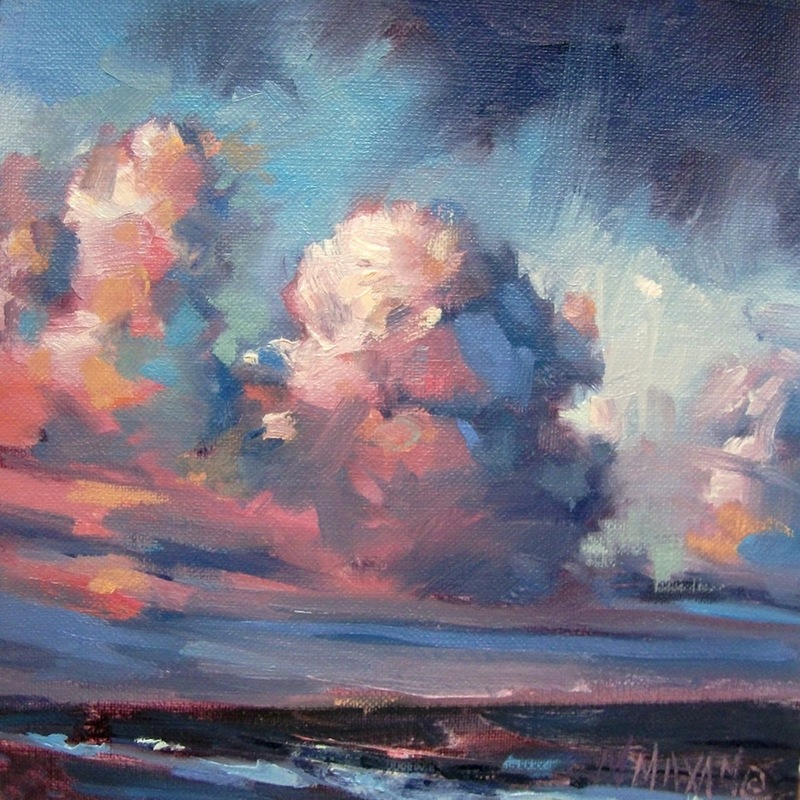 This Giveaway of her Original Painting "Red Clouds" valued at $150.00 is open Internationally! 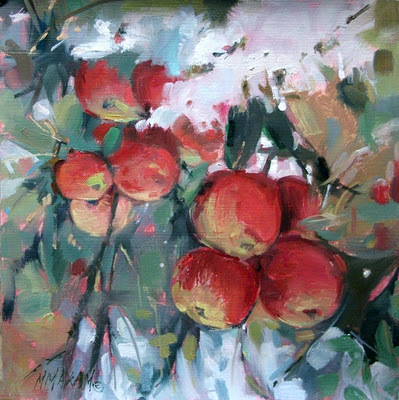 Mary Maxam- Paintings , come and tell us what work of her fabulous art you like the best! 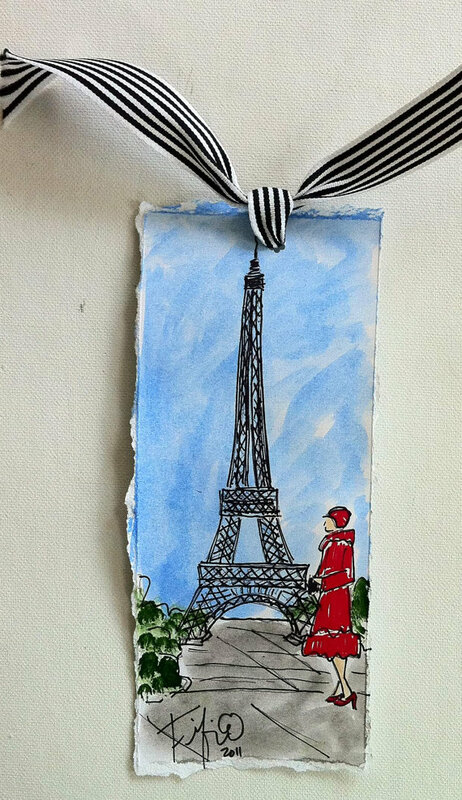 2) As an Extra Entry Link or Post about this Fine Art Giveaway on your site! get in the Spirit and Spread the Love! Remember to enter all of the other Open Giveaways!! The support for our Blog Friends and Sponsors has been tremendous .... Come back tomorrow for a huge surprise!! The 11th Day of Holiday Giveaways if from Fifi Flowers. 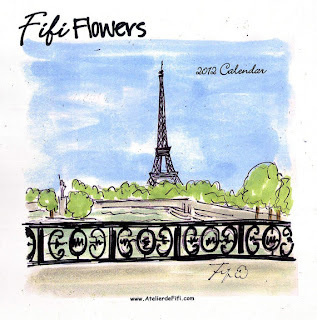 This original framed and matted Work of Art, a set of eight Notecards, a 2012 Calendar of Eiffel Tower Scenes in Paris, and a Bookmark of Fifi's original art! A great assortment of Paintings of original art, prints, calendars, notecards and bookmarks are available on her site! Can you tell that Paris and all things French are on our Minds. 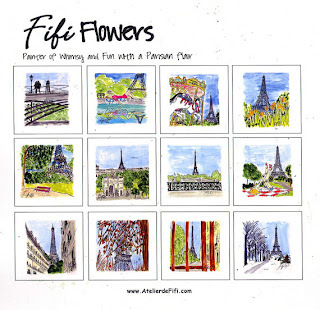 That is how my affinity and friendship with Fifi and several other Blog friends began! PS : I must order these for myself!! 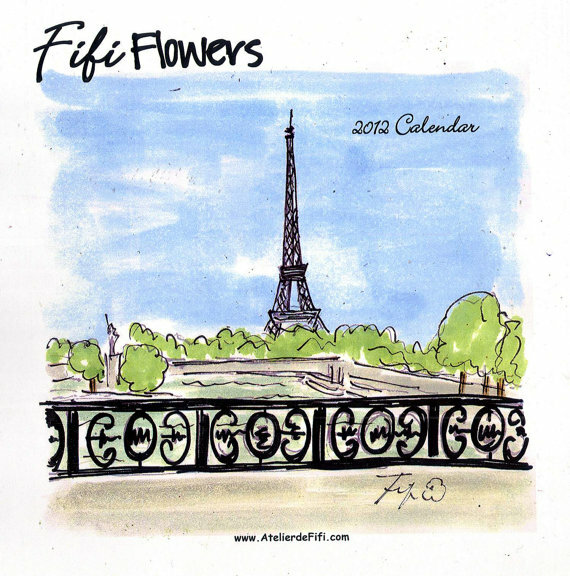 Hint, Hint you can use these calender art pages to frame later !! This Giveaway is Open Internationally to friends and followers! 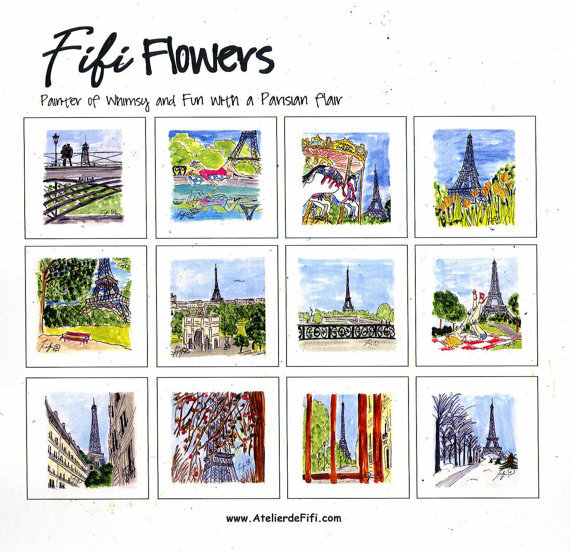 1) To enter Visit Fifi Flowers peruse her blog and come tell us what you love the most! 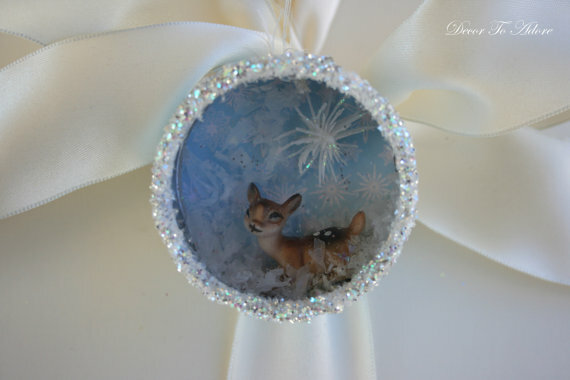 2) For an Extra entry be a Follower of Fifi Flowers! 3) Another Entry chance if you post or link to this Fun and Fabulous Giveaway on your own site! Share the Love! Also enter all of the other Giveaways open by simply scrolling down or clicking on the Giveaway links in the right hand column! Thank you all for supporting our fellow blogger friends and sponsors!! 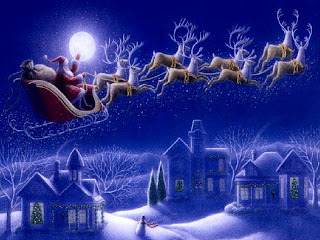 I truly wish I could have a gift for all of you! After closing her small design business in Pennsylvania and moving to Virginia a year ago, Kerry has concentrated on decorating her own home and writing her blog. 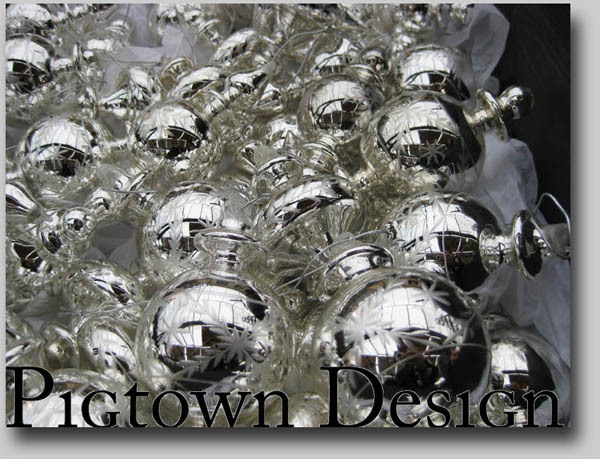 DesignDuMonde is her newly named blog about design and art. 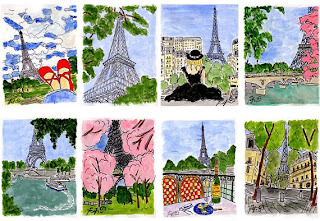 Her Etsy shop of the same name sells small paintings and matted antique architectural prints. Kerry makes the mats in standard frame sizes so that budget conscious buyers can frame them for just a few dollars. She will also custom frame any of the prints. The antique prints are a great way to include art that is not mass-produced and achieve a sophisticated look. The antique print for the Giveaway is a study of decorative capitals matted in a dark gray mat and custom framed in an 11" x 14" black frame. Kerry will also offer 10% off any item in my Etsy shop with the code HOLIDAYBLOG through December 30th. To enter this Giveaway for the framed Architectural Print be a USA resident. 1) Visit Kerry at Design du Monde become a Follower of this up and coming young designer; visit her Etsy Shop, come and tell us what you like best in Kerry's shop. 2) For an additional entry Please Link to this Giveaway on your Site or Post about it! Pay it Forward! 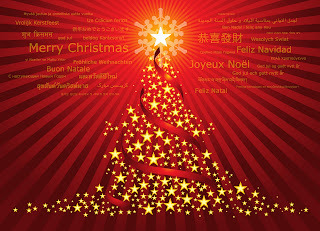 Several Gifts will close on the 15th so spread the word! Our friend, fellow Blogger, entrepreneur, and shop owner, Laura Ingalls Gunn, has offered a very generous surprise to one fortunate winner! 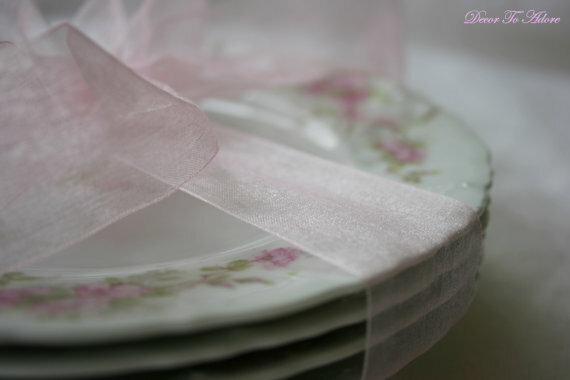 A $25 Gift Certificate to her Etsy shop plus several special gifts! Laura is always busy being very creative. I have asked her if her fingers are ever NOT moving! I love these patterned pieces in her shop! Laura always has an open and giving heart! Her Faith and family come first to her. 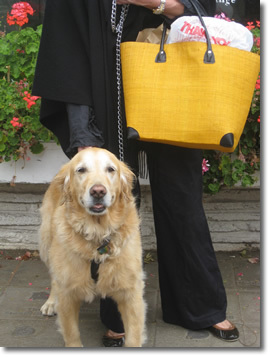 She and our friend Andrea are partners in Metis Linens! This wonderful Holiday Giveaway is open to USA residents. International entries accepted if the winner agrees to pay shipping fee. 1) To enter this Giveaway, Please visit Laura's Blog Decor to Adore, visit her Etsy Shop and tell us what you love! 2) For an Extra Entry, Post or link to this Giveaway on Your own site!! Please enter all of the open Giveaways by scrolling down or clicking on the Buttons in the right hand Column! Thank you for supporting all of our generous sponsors and blog friends! 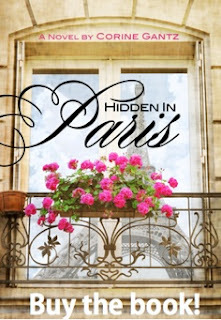 The Paris Apartment & Hidden in Paris on the 7th & 8th Days of Holiday Giveaways Event!! On the the 7th & 8th Days of Holiday Giveaways we have some very exciting surprises!! Claudia from The Paris Apartment is offering to three (3) winners a copy of her book. 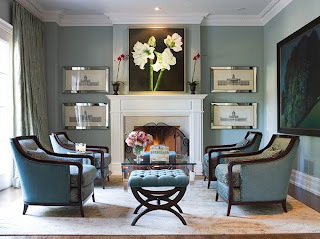 The Paris Apartment is a popular shop in New York's East Village, where visitors can step back in time and immerse themselves in the beauty and romance of antique furnishings. Reflecting an unusual mix of design influences (Baroque, rococo, neoclassical and Art Deco) and personal taste, its style is luxurious, playful, and wholly original. In The Paris Apartment, Claudia Strasser, the founder and owner of the shop, offers readers the quintessential guide to achieving this romantic Parisian look without having to spend a fortune. With easy-to-follow instructions and helpful advice, she shows readers how they can transform their homes into a living environment that reflects both their personal style and timeless French elegance. 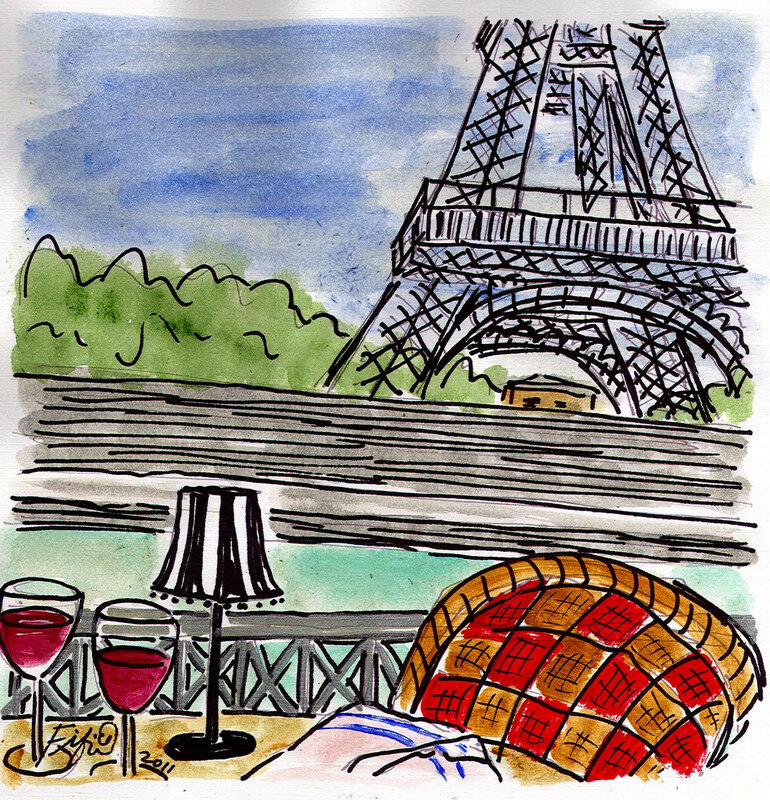 Laid out in the form of an entertaining diary, the book helps Francophiles define their fantasy home, find inspiration, select a color palette and use light creatively. She also includes instructions for making canopies and valances; advice on dyeing fabrics and restyling furniture; tips on budgeting; guidance on shopping at flea markets and auctions; and a glossary of terms. Color photographs throughout illustrate the ideas and techniques shown in the book. As interest in the home experiences a resurgence, and as Americans become more careful about their spending, nesting has become the pastime of the '90s. People want luxury homes without spending a fortune. With its unbeatable combination of style and solid practicality, The Paris Apartment is a home-decorating guide to treasure and draw inspiration from for many years to come. 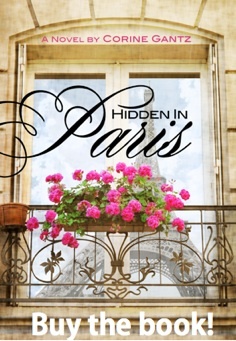 The second wonderful part of this Holiday Giveaway Is from Corine Gantz the author of Hidden in Paris!! She is also giving away A copy of this Novel to three (3) winners! ! I loved reading this book and I know you will enjoy it! Three women running away from their lives become unlikely friends in a beautiful house in the heart of Paris. Lost in France, a country she mistrusts, among French people she hardly understands, Annie has trouble venturing away from home since the death of her husband. And since home happens to be a small jewel of a house nestled in the heart of Paris, why would she ever want to? But when bankruptcy threatens her beloved house, her one anchor in life, Annie has no choice but to find renters, and quick. Leave it to someone socially phobic to phrase a want ad in all the wrong ways. 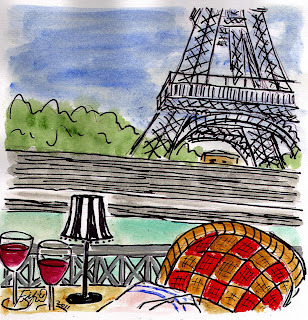 With shimmering promises of ‘Starting over in Paris’ –– a concept she has no intention of applying to her own life––Annie attracts tenants with the kind of baggage that doesn’t fit in suitcases. A long-legged, cool-headed ex model (everything Annie is not) on the run from her abusive husband, a frail young woman harboring a possible death wish, a mysterious French artist, and an infuriating blue-blooded French man soon threaten Annie’s way of life in ways she never anticipated. 1) To enter this Giveaway visit The Paris Apartment Collection; come back and tell us what you love most, so many exciting finds!! Then go and visit Corine's site; come back and comment on her book, her blog, about the Author, whatever you would like! 2) For an extra entry post or announce in you column a link to this giveaway on your own site. Spread the Holiday Cheer!! Six (6) winners will be chosen on Sunday December 18th!! Please enter the other Giveaways that are still open!! Support your fellow bloggers and sponsors! God love those who Pay it Forward! Andrea of French Basketeer and Metis Linens has provided Five Golden Rings, plus one to spare for a set of six. 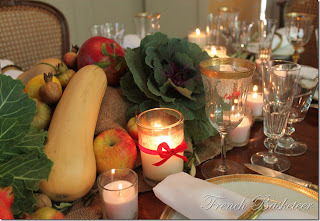 Well, OK they are really French Brass Curtain Rings, but they can double easily on your holiday table for napkin rings! They are made of what the French call "Laiton" or "yellow copper." Brass is an alloy of copper and just a little zinc, sometimes other metals are added in small amounts; but somehow the French version comes with a beautiful golden patina unlike most of the brass found today. 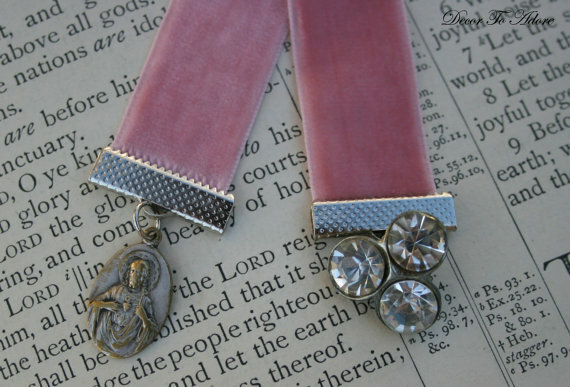 The rings are 2 3/4" in diameter to the edges. 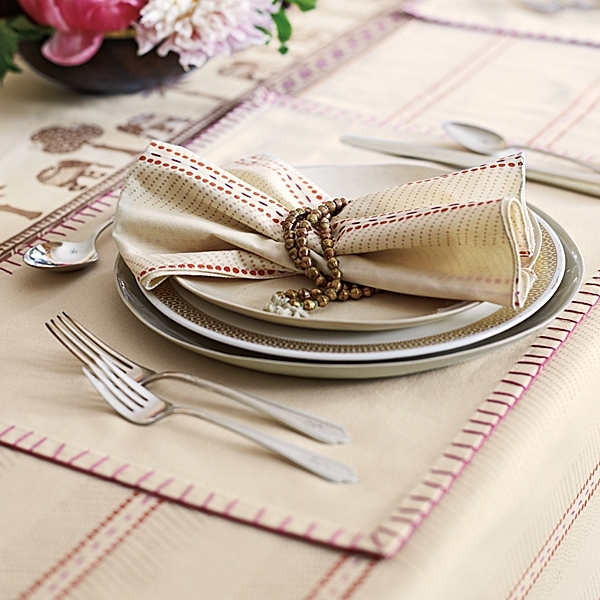 Andrea is also providing a pair of vintage linen dishtowels with red "CR" monogram. The towels are a generous 34" x 29" and have oh, probably another 100 years of wear left in them. They can be ironed flat or used as shown here, straight from a tumble in the dryer. These rings have a beautiful patina just as they were found, in France. I have several of these and trust me they are gorgeous, very unique! 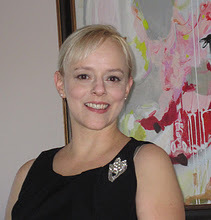 Andrea's blog features her delicious gourmet cooking, recipes, entertaining and more! 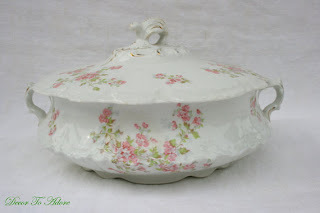 1) Visit any of Andrea's sites I have listed, The French Basketeer Blog, French Basketeer Website, or Metis Linens. Come back and comment on what you love most about what you see! It can be a product, a recipe, an image! 2) For an extra Entry Spread the Holiday Cheer about this Giveaway on your own site!! The Winner will be chosen on December 18th at Midnight EST!! Please enter all of the special Open Holiday Giveaways by clicking on the right hand icons! 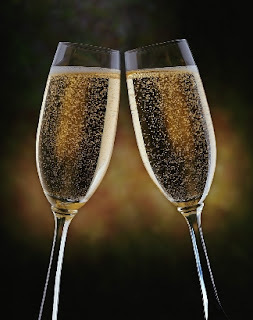 Thanks to all of you for your encouragement and support of these sponsors and fellow bloggers!! 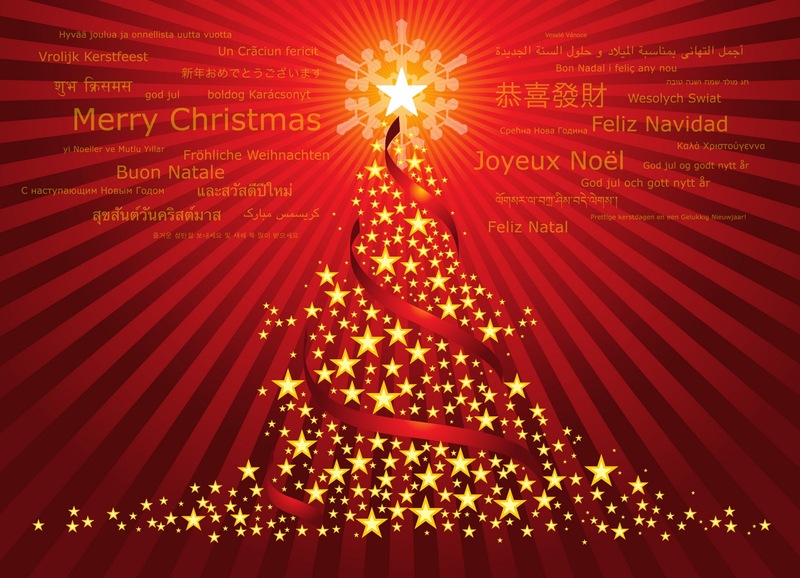 On The 4th Day of Holiday Giveaways! !